Happy 2019 friends! We are so excited for what this new year has to bring, and so incredibly grateful for all of the amazing couples we were able to meet and create friendships with in 2018. In December, we had 3 elopements, and this was the first of the bunch. 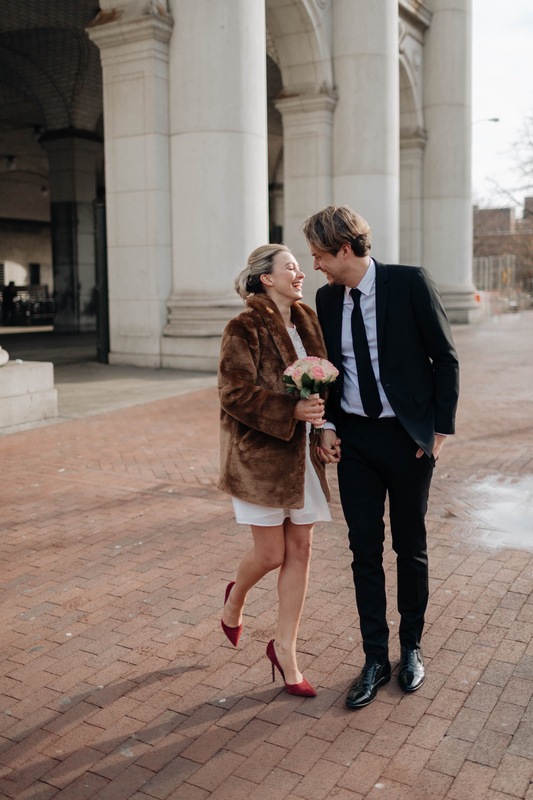 Emily + Luke traveled across the pond to New York City from London, where they decided to elope and marry each other with just theirselves and us as their witnesses. Emily + Luke’s love was something special, and it was a joy and honor to capture such a significant moment in their love story. We were also honored that they asked us to be the ones they shared the moments with, as they did not even know us before this day. We were able to get to know them throughout the morning though, and a friendship kindled quickly — we even told them we are gonna come visit them in London soon, haha! Any who, long story short. We met them at the courthouse where they filed all the official papers and exchanged vows to one another along with rings, and then we headed out around city hall to explore. They *attempted* to hail a taxi (we then got an Uber because all the taxis were full) and then headed over the Brooklyn Bridge and into Brooklyn (DUMBO specifically). It was a lovely day with incredible light and amazing views, but the best of all was the love that was witnessed and the union that began. We hope you enjoy these photos as much as we do, feel free to share with your friends, and if you know anyone wanting to elope to NYC or Brooklyn, we are always ready to come along for the ride!